Seasons USA, Inc. Z18071 - Crafted from durable all-weather plastic. Bendable tail and moveable head and jaw. Part of the original Crazy Bonez Skeleton line. 14" tall skeleton cat. This cat has ran out of its nine lives and has a bone to pick with you. The perfect companion for your Crazy Bonez Skeleton. Kitty bonez is 14 inches tall to the top of the tail and has a bendable tail and moveable head and jaw. Spooky addition to any Halloween scene or decoration. Seasons USA, Inc. Z18724 - Posable limbs with knees that lock into place to hold a position. Crazy bonez limbs are poseable, with knees that lock into place to hold a position. The detailed bones include a full rib cage, arms and legs, spine, and skull with a movable jaw. Crafted from durable all-weather plastic. The crazy bonez skeleton stand sold separately is the perfect accessory to make him stand on his own! Stands 60" Tall. Spooky addition to any Halloween scene or display. Will stand erect against a wall and will be stiff but cannot stand freely. No haunted house is complete without a Crazy Bonez skeleton in the closet! Crazy Bonez stands approximately 60" Tall and features realistic molded bones. Part of the original Crazy Bonez skeleton line. Seasons USA, Inc. Z18144 - Bendable neck and moveable head. Spooky addition to any Halloween scene or display. This buzzard is 10 inches tall with a bendable neck and moveable head. Crafted from durable all-weather plastic. Crafted from durable all-weather plastic. 10" tall skeleton vulture. Part of the original Crazy Bonez skeleton line. Posable limbs with knees that lock into place to hold a position. This skeleton vulture has a bone to pick with you. Add it to your Crazy Bonez collection today. Part of the original Crazy Bonez Skeleton line. Stands 60" Tall. Spooky addition to any Halloween scene or decoration. Seasons USA, Inc. Z18213 - Spooky addition to any Halloween scene or decoration. Add it to your Crazy Bonez collection today. Bendable neck and moveable head. Bendable tail and moveable head and jaw. Stands 60" Tall. Part of the original Crazy Bonez skeleton line. 18" long skeleton rat, nose to tail. Part of the original Crazy Bonez Skeleton line.
. Spooky addition to any Halloween scene or display. Spooky addition to any Halloween scene or decoration. Crafted from durable all-weather plastic. 10" tall skeleton vulture. Crafted from durable all-weather plastic. Posable limbs with knees that lock into place to hold a position. Crafted from durable all-weather plastic. Crazy Bonez Skeleton - Rat Bonez - Rat bonez is 18" long from nose to tail 8" body, 10" tail and has a bendable tail and a moveable head and jaw. Part of the original Crazy Bonez Skeleton line. Seasons USA, Inc. Z18119 - Moveable head and wings. Part of the original Crazy Bonez Skeleton line. Spooky addition to any Halloween scene or decoration. Part of the original Crazy Bonez skeleton line. Posable limbs with knees that lock into place to hold a position. Crafted from durable all-weather plastic. This 8 inch tall raven has a moveable head and wings. Part of the original Crazy Bonez Skeleton line. Spooky addition to any Halloween scene or display. 10" tall skeleton vulture. Birds of feather flock together, birds of bones scare you out of your house and home. Crafted from durable all-weather plastic. Spooky addition to any Halloween scene or decoration. A great companion for your Crazy Bonez Skeleton. Crazy Bonez Skeleton Raven - 18" long skeleton rat, nose to tail. Bendable tail and moveable head and jaw. Part of the original Crazy Bonez Skeleton line. Stands 60" Tall. Spooky addition to any Halloween scene or decoration. Crafted from durable all-weather plastic. Seasons USA, Inc. Z28042 - Bendable neck and moveable head. Part of the original Crazy Bonez Skeleton line. Stands 60" Tall. Spooky addition to any Halloween scene or decoration. Part of the original Crazy Bonez Skeleton line. Posable limbs with knees that lock into place to hold a position. 8" tall skeleton raven. 10" tall skeleton vulture. Part of the original Crazy Bonez skeleton line. New addition to the original Crazy Bonez skeleton line. Crafted from durable all-weather plastic. Bendable tail and moveable head and jaw. Puppy bonez is 19" long from nose to tail. Bendable tail and moveable head and jaw. Crafted from durable all-weather plastic. This skeleton puppy is looking for a good house, preferably haunted. Crazy Bonez Skeleton Dog - Puppy Bonez - Crafted from durable all-weather plastic. Spooky addition to any Halloween scene or decoration. Moveable head and wings. He has a bendable tail and a moveable head and jaw. Spooky addition to any Halloween scene or display. Seasons USA, Inc. Z18145 - Crafted from durable all-weather plastic. Part of the original Crazy Bonez Skeleton line. 18" long skeleton rat, nose to tail. This crazy Bonez skeleton rat is 11. 5 inches tall. Part of the original Crazy Bonez Skeleton line. Part of the original Crazy Bonez Skeleton line. Spooky addition to any Halloween scene or decoration. 8" tall skeleton raven. Spooky addition to any Halloween scene or decoration. You will be hurrying when you see this Skeleton Rat scurrying. Part of the original Crazy Bonez skeleton line. Bendable neck and moveable head. Part of the original Crazy Bonez Skeleton line. Crafted from durable all-weather plastic. Crafted from durable all-weather plastic. Crazy Bonez Skeleton Rat - 11. 5" tall skeleton rat. Add it to your Crazy Bonez collection today. Crafted from durable all-weather plastic. Crafted from durable all-weather plastic. Seasons USA, Inc. Z28048 - Bendable tail and moveable head and jaw. 13. 5" tall skeleton owl. Part of the original Crazy Bonez Skeleton line. Part of the original Crazy Bonez Skeleton line. Part of the original Crazy Bonez Skeleton line. Spooky addition to any Halloween scene or decoration. Bendable tail and moveable head and jaw. A great companion for your Crazy Bonez Skeleton. Part of the original Crazy Bonez skeleton line. New addition to the original Crazy Bonez skeleton line. 18" long skeleton rat, nose to tail. The crazy bonez Skeleton Owl is approximately 13. 5" tall. 11. 5" tall skeleton rat. 8" tall skeleton raven. Puppy bonez is 19" long from nose to tail. Crafted from durable all-weather plastic. Crazy Bonez Skeleton Owl - Crafted from durable all-weather plastic. Crafted from durable all-weather plastic. Part of the original Crazy Bonez Skeleton line. Part of the original Crazy Bonez Skeleton line. Seasons USA, Inc. Z28043 - 11. 5" tall skeleton rat. New addition to the original Crazy Bonez skeleton line. Part of the original Crazy Bonez Skeleton line. Spooky addition to any Halloween scene or display. Crafted from durable all-weather plastic. Puppy bonez is 19" long from nose to tail. Bendable tail and moveable head and jaw. Posable limbs with knees that lock into place to hold a position. Bendable tail and moveable head and jaw. Part of the original Crazy Bonez Skeleton line. Crafted from durable all-weather plastic. 18" long skeleton rat, nose to tail. Spooky addition to any Halloween scene or decoration. Crafted from durable all-weather plastic. Part of the original Crazy Bonez Skeleton line. Moveable head. 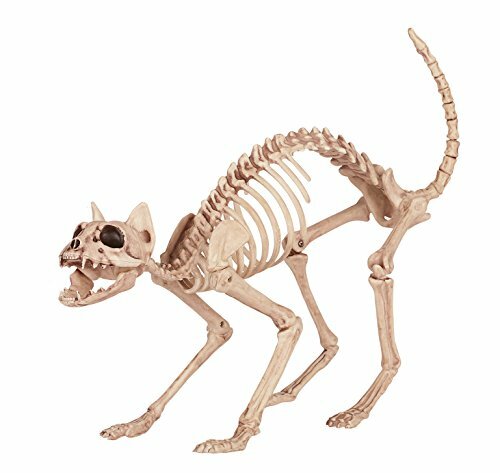 Crazy Bonez Skeleton Cat - Lil' Kitty Bonez - You will love this adorable pouncing skeleton kitty to death! Lil' Kitty Bonez is 7" tall with a bendable tail and a movable head and jaw. Spooky addition to any Halloween scene or decoration. Crafted from durable all-weather plastic. Stands 60" Tall. Seasons USA, Inc. Z28280 - Spooky addition to any Halloween scene or decoration. Moveable head and jaw, can hang from string or upside down from feet. Bendable tail and movable head and jaw. Spooky addition to any Halloween scene or decoration. The crazy bonez bone chilling bat measures approximately 22" wide and 12" Tall and has a moveable head and jaw. 22" wide skeleton bat. 11. 5" tall skeleton rat. Puppy bonez is 19" long from nose to tail. Moveable head and wings. Crafted from durable all-weather plastic. Bendable tail and moveable head and jaw. Part of the original Crazy Bonez Skeleton line. Stands 60" Tall. Crafted from durable all-weather plastic. Crafted from durable plastic with a realistic bone appearance. Crazy Bonez Bone Chilling Bat, 22" - Part of the original Crazy Bonez skeleton line. Add to your Crazy Bonez collection today! Part of the original Crazy Bonez skeleton line. Part of the original Crazy Bonez Skeleton line. Seasons USA, Inc. Z18134 - Moveable head. Bendable neck and moveable head. Spooky addition to any Halloween scene or decoration. The large size buster bonez dog needs a home, will you take him in? Buster is 21 inches long and had a posable jaw and tail. Spooky addition to any Halloween scene or decoration. Crafted from durable all-weather plastic. Spooky addition to any Halloween scene or decoration. Crafted from durable all-weather plastic. New addition to the original Crazy Bonez skeleton line. Crafted from durable all-weather plastic. Bendable tail and moveable head and jaw. Crafted from durable all-weather plastic. 10" tall skeleton vulture. 21" tall skeleton dog. Crazy Bonez Skeleton Dog - Buster Bonez - Part of the original Crazy Bonez skeleton line. Spooky addition to any Halloween scene or decoration. Bendable tail and moveable head and jaw. 7" tall pouncing skeleton kitty. Part of the original Crazy Bonez Skeleton line. Crafted from durable all-weather plastic.